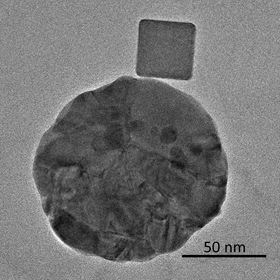 This transmission electron microscope image shows a palladium nanocube next to a gold disk, which focuses light onto the nanocube. Image: Michal Vadai. When Michal Vadai's experiment worked for the first time, she jumped out of her seat. Vadai, a postdoctoral fellow at Stanford University, had spent months designing and troubleshooting a new tool that could greatly expand the capability of an advanced microscope at the Stanford Nano Shared Facilities. Despite heavy skepticism from the microscopy community, she and her fellow researchers were attempting a union between light microscopy and transmission electron microscopy that, if successful, would reveal a single particle undergoing a light-activated reaction. "I cannot stress how exciting it was to make it work the first time. It was a huge technological challenge," said Vadai, who is in the lab of Jennifer Dionne, associate professor of materials science and engineering at Stanford University. "The first time we got the beginning of an experimental result, we were shouting out loud. It was very, very exciting that we could see and control what was happening to this nanoparticle with light." The study, reported in a paper in Nature Communications, focused on a photocatalytic reaction where energy from visible light initiates a chemical reaction in nanocubes of palladium. Each of these cubes is about 30nm on each side – roughly the size of a cold virus. Scientists know a lot about photocatalysis based on large groups of nanoparticles, but the new technique allows researchers to study what occurs in individual nanoparticles. Beyond photocatalysis, this technique could someday be used to study almost any interaction between light and matter at a resolution of about 2nm, even those that occur in living cells. Transmission electron microscopy forms an image by beaming electrons through a thin slice of material. This process can reveal structures in intricate detail, but it doesn't allow scientists to observe materials as they change under different light conditions, as happens with light receptors in the eye, materials used in solar cells or, in this case, palladium nanocubes for catalysis. The new setup melds the resolution of electron microscopy with the color of light microscopy. "One of the biggest achievements of this paper is the technique itself," Dionne said. "We bring light of various 'colors' to the electron microscope. Our measurements are direct – one can visibly see the photochemical reaction as it unfolds within the nanoparticle." The new technique involved a custom-designed specimen holder, in which the sample was loaded. Surrounding that were mirrors to focus the light from two optical fibers, with a gap between them for the electron beam. The entire design had to fit in a very limited space: a 5mm gap in the microscope. To test the setup, the researchers pumped the specimen's chamber with hydrogen. Looking through the electron microscope, they could confirm that the palladium nanocube changed its phase as it filled up with hydrogen. The experiment was structured so that the nanocube would remain in this hydrogen-filled phase until the researchers turned on the light. Once they did this – by reflecting light from a nearby gold disk – the researchers watched as a water-like wave flowed gracefully across the nanocube – the hydrogen leaving the palladium. It was a light-based reaction seen by an electron microscope and a jump-for-joy-worthy success. Nanoparticles are often produced and studied in large numbers, which means scientists know they vary in size, shape or position – but they know little about how those variations affect performance. "If you really want to dive down to the fundamental physics of what's happening, you need to look at single particles because we know individual differences matter," said Vadai. "It's like a mystery and you have to get a good look at one clue to be able to solve that." The initial experiments were largely designed to show that the technique could work, but they still revealed something new about the nanocubes. For one, the reaction happens 10 times faster in the light than in the dark. The researchers could also see how each step of the reaction – the hydrogen leaving the nanocube, the lattice structure of the nanocube rearranging – is affected by different wavelengths of light. It also turns out that the corner of the nanocube closest to the gold disk is most reactive. Understanding how and why that happened could potentially allow for product-selective reactions based on the catalyst geometry. With the success of this proof of concept, the lab is on to the next steps. For example, the researchers aim to add spectroscopy capabilities, which would allow them to evaluate the light generated from these reactions in order to analyze the chemistry in greater detail. "If you're talking about a single particle, you usually have to fight to see these weak signals," Vadai said. "Looking forward, this will be a complete suite of tools that you can use to study interaction of light and matter in the nanoscale in real time, at very high resolution, at a single-particle level." This story is adapted from material from Stanford University, with editorial changes made by Materials Today. The views expressed in this article do not necessarily represent those of Elsevier. Link to original source.